In the song we count five Santas, five reindeer and five elves. To make the song more fun, I added some actions for each character. Your students will have a lot of fun with this song. Recommend Ages 2-7. Click here to download a Free MP3 of this song to use in your classes. (please note the song is copyright and this is for classroom use only. Start by introducing the characters in the song using the poster: Santa, Reindeer, Elf. Teach each character name with the action. Santa says, “ho, ho, ho”, the reindeer jump, and the elves dance. Practice counting the numbers 1 to 5 using your hands or the poster. Watch the video and sing along and do the actions. 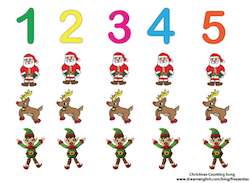 You can use the poster above to ask the students questions like, “How many Santas?” For example, use another piece of paper to cover up two Santas. Next, ask the students to count the remaining Santas. The answer is 3 Santas! Repeat with other characters. Try a simple gesture game. Do the actions of one of the characters, and ask the students to guess which character you are. For example, dance like an elf, and ask the students, “Who am I?” The student should answer elf. You can also let your students try to be the characters. They will love it! I hope you have a lot of fun singing this song in your classes! Check out more Christmas songs from Dream English at www.dreamenglish.com/christmas Merry Christmas!